Choose our Electric Trout Artist T-Shirt this season, the perfect t-shirt for fans of the 1970's rock band. With plenty of years of great music to celebrate, our Electric Trout t-shirt takes inspiration from their album cover so you can now wear it and show you're a dedicated fan! This exclusive design for Weird Fish is a limited edition cotton Artist T-Shirt, available in a variety of colours and featuring the 'Electric Trout' print in large on the back with a smaller version on the chest. 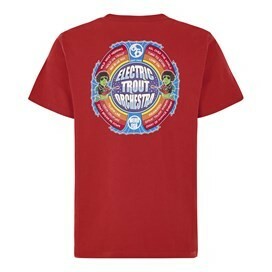 My son loved this ELO based t shirt with fun fish themed titles. Nice colour and the sizing (L) was fine. 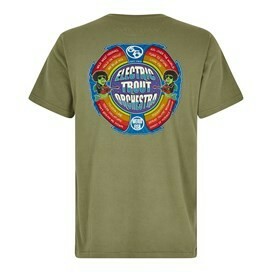 Great fans of ELO so this was a must.... Excellent Tshirt, very clever. These Tshirts are always good quality, great fit, and nice colours. They wash and wear very well with no fading or degrading of the transfers, they keep their shape and need minimal ironing. Always a pleasure to deal with this company. Speedy delivery and well packaged. Will carry on looking out for the new ones to add to the "Collection"